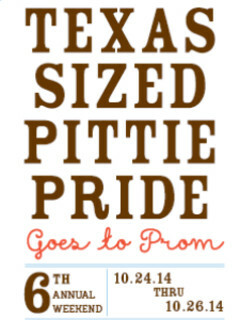 Join the entire Love-A-Bull team at the Texas-Sized Pittie Pride Prom Night benefiting Love-A-Bull. The kind of "prom" that you want it to be is up to your interruption. You can come dressed like as if you're going to Hollywood or a hoedown, or even a different decade. Tickets include cocktails, appetizers and your very own prom photo, plus a silent auction and costume contest — so dress to impress. This will be a people only celebration, so please leave the pooches at home.